Please contact Rae (rae@luvzhorses.com) for more information about this pet.Hi There,My name is Bria and I was living at the Comanche, TX shelter when they discovered I was pregnant. They scurried and made arrangements for me to get out of the shelter ASAP so I wouldn't have my babies there.The nice ladies at Comanche, especially Laurie and Kimberly worked quickly and got me to ASR and into a foster home on Tuesday and I had my babies on Thursday! Talk about the nick of time!I am the proud healthy mother of three little cuties who will be up for adoption in 8-10 weeks time. I will then need my own forever home and if you would like to have me as a BFF please come to meet me. I'm a very loving girl and a really good Mom and I purr all the time!5/6/16 UPDATE: Bria has come a very long way and is now ready for a forever home. She is a silly, bouncy kitty with a bit of 'tude', but she is friendly and ready for more. She isn't really comfortable with most of the kitties in our home, but plays with Darth as if he was her baby or she was his sister. She has gotten a lot more comfortable with humans as well. She will rub up against my legs and allow me to pet her on the head and chest and one or two strokes down her back and then gets excited and sends 'warning' signals. I think she just gets easily over stimulated, but she can be a bit nippy so she is not a good choice for a family with small children. 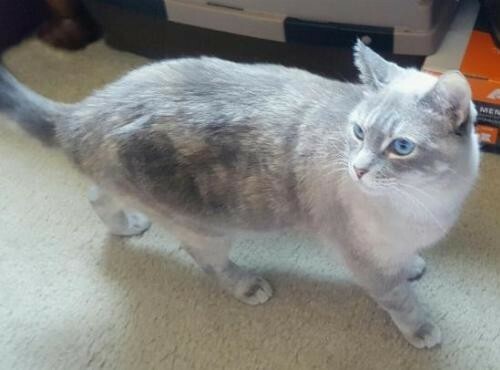 She would be great as a companion for an adult home with one other kitty as long as she is allowed plenty of time to acclimate and get used to the other kitty. I do believe that if Bria has a home of her own where she has more area to roam (right now she stays basically in one big bedroom) she will come completely out of her fear shell and become a really sweet and loving kitty. Won't you tkae a chance on this girl? She deserves a place of her own after such a rough start.UPDATE: July 2017 - Bria is definately a good candidate for an adult home with one or even two other kitties. She is now integrated into the population and managing nicely. She isn't agressive and will back down from confrontation but sometimes she will defend herself a bit. She still is a sweet girl but still gets a bit over excited at too much petting. She really needs a quiet home where she can ask for and get the attention and love she deserves. She'd make a great companion!Visit this organization's web site to see any additional information available about this pet.